February is the heaviest month. The winds which seemed so refreshing in the fall now leave me weary. The sparkling snowflakes of December have become crusty mounds of ice. My mood is like the plastic bag caught in the limbs of the backyard apple tree. I've watched that bag throughout the winter, how it has become progressively more tattered and grey, a gracile castaway. Stuck in February, my daydreams are of the sound-scent of leaves unfurling, of sun on my toes. Today was all about soul-soothing comfort food, also known in my house as stew. I had planned to write about the black walnut shell-smoked roadkill deer (please read this post about roadkill if you haven't previously) that I made the other night. The black walnuts were some I collected last fall, and only later realized they contained withered unusable nuts. So, I soaked the shells for a few days, wrapped them in a foil pack, pierced it, and threw it on the fire while grilling the roadkill deer. It was perfectly delicious. This stew, made with the leftovers, was even better. It had all of the smoky goodness of the grilled venison steaks, but enriched and made more mysterious with dried porcini mushrooms and local spices. 1. Place the dried mushrooms into a bowl, and cover with the boiling water. Set aside for at least 30 minutes. 2. In a heavy bottomed pot, saute the salt pork over medium heat until it is crispy, and the fat has rendered. 3. Add the onion, celery, garlic, and spices to the pot. Stir, and let cook until the vegetables are translucent, and the spices have become fragrant. Add the leftover roadkill to the vegetables. 4. Using your hands, scoop the rehydrated mushrooms from the water, and add them to the pot. Carefully pour the soaking water into the pot, so that any grit stays behind in the soaking bowl. 5. Add tomatoes and wine to the pot. Salt to taste, and let simmer over a low heat for at least 45 minutes. 6. 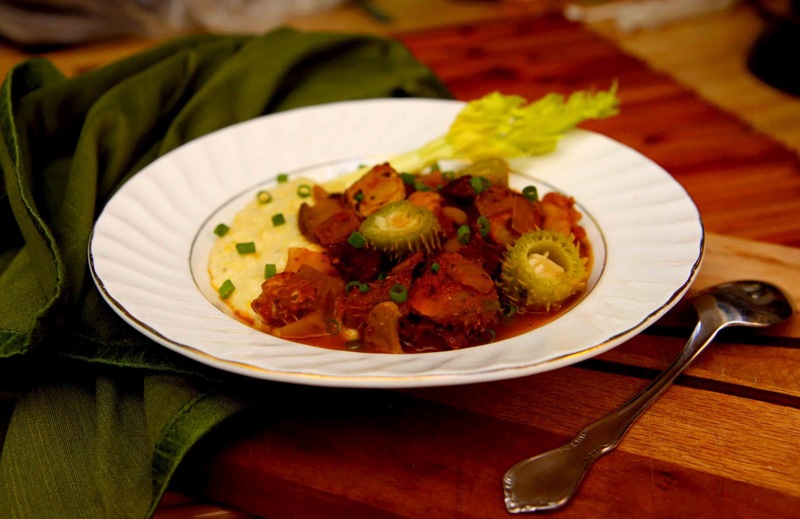 Ten minutes before serving, throw the chopped milkweed pods into the stew. 7. To finish, add the sherry vinegar, and adjust the salt. 8. Serve over polenta or rice. Top with a little orange zest, and chopped green onion or parsley. *If you don't have smoked meat, substitute smoked paprika for sweet paprika. Hank Shaw's Chilindron Stew was in the back of my mind when I made this stew. I highly recommend you check out his recipe, too. I'm sharing this recipe with Real Food Wednesday, Pennywise Platter Thursday, and Fight Back Friday. I would just like to point out how beautiful those milkweed pods are, and how excited I am to try them!! And yes... tattered plastic bag in winter... I hear ya. Does winter have dogs days, or only summer?